On 24 February we wrote an open letter to each cabinet member, including An Taoiseach, calling on the office holders to defer moving the 35th Amendment Bill until such time as Article 12.8 was repealed (Presidential Oath). 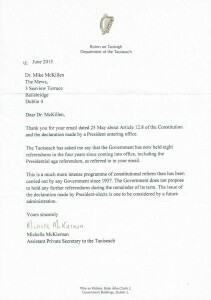 We had a tiny number of replies from cabinet and Oireachtas members. It was similar for the TDs. No one wanted to engage with our issue. Here is the reply received from the Office of An Taoiseach (dated 16 June – long after our original letter). But the response does not explain why Article 12.8 was not reformed first.